What Causes Children's Heel Pain? As a parent, you hate to see your child in pain. If your child is complaining of heel or foot pain, Dr. Harvey Danciger has the solutions for you. Children’s feet grow and change much faster than adult feet, which is why it is important to inspect their feet regularly to make sure there are no abnormalities. Checking your child’s feet will help ensure they are maturing strong and healthy. During the first year, your baby’s feet grow quickly. It’s important to make sure their feet are unrestricted from tight shoes, which will restrict their ability to move their feet freely. Too much pressure from shoes put a strain on their feet and can alter your children’s foot shape during the first year. Once your child begins to walk, watch their gait closely. Most toddlers will develop a pigeon-toe gait or land on their toes instead of their heels. These conditions should not cause worry as children most likely outgrow them as they grow older. However, other abnormal conditions that you may detect early can be easily corrected. If your child has flat feet, or mild to severe in-toeing or out-toeing, treatment by Dr. Danciger can help correct the problem. Treatment options include orthotics, different sitting positions, splints or night braces. To allow your children’s feet space for healthy growth, make sure their shoes leave enough room for their toes to move freely. Also, check their shoe size each time shoes are bought. 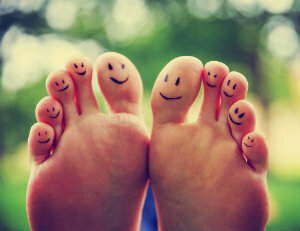 By the age of seven or eight, your child’s feet are well-formed. A podiatrist’s care can help make sure bone problems are reduced if their growth plate has been injured or if other troublesome conditions are affecting their foot health. Don't wait to have your child's feet evaluated by a podiatrist. Schedule an appointment online with Dr. Harvey Danciger today or by calling his Palm Desert office at (760) 568-0108.